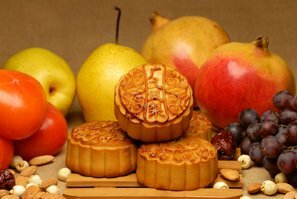 Mid-Autumn Festival is the second most important festival in China after the Spring Festival. Celebrations are held throughout the country. Here are some recommended places to celebrate the festival in China. 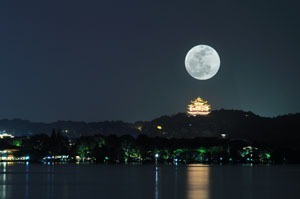 Beihai Park was where Chinese emperors appreciated the moon. The moon reflection in the water makes the lake very beautiful. You can take a cruise with your family or friends on the lake, appreciating the moon and enjoying mooncakes and tea. Click for more places to celebrate Mid-Autumn Festival in Beijing. Shanghai boasts skyscrapers offering good places to see the moon over the city. One of the best places is the Oriental Pearl TV Tower. It is 468 meters (1540 ft) high. There is a revolving restaurant where you can enjoy a dinner, and a sightseeing platform, from which you can view the moon and get a beautiful panoramic view of the city. Learn more about Mid-Autumn Festival in Shanghai. 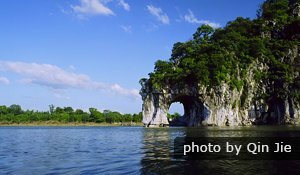 At night the reflection of the moon can be seen through the arch of Elephant Hill, and it looks as if it is under the water and floating on the surface of the water at the same time: one moon in the sky and two reflections — "the three moons". 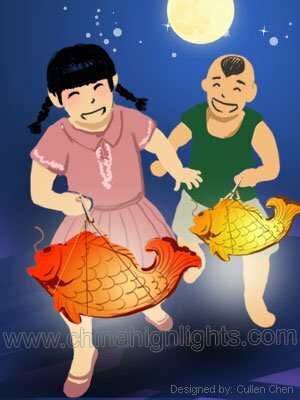 During the Mid-Autumn Festival, there are various celebrations in Hong Kong, including huge, expertly-designed lanterns displays, big fire dragon dances, folk music, traditional stage shows, and lantern riddle quizzes. The grandest of all these is held in Victoria Park. Victoria Park is also the best place to gaze at the moon (in the city). Every year, many people come to the park with their families and friends to appreciate the moon. Learn more about places to celebrate the Mid-Autumn Festival in Hong Kong. Three Ponds Mirroring the Moon has been a best place to appreciate the moon since ancient times. 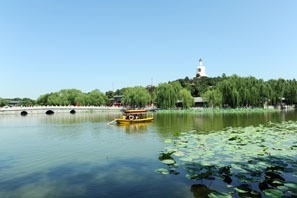 It is one of the famous scenic spots on West Lake and can be found on the back of the 1 yuan bill. On Mid-Autumn Festival, when the moon shines full and bright in the sky, candles are lit on the three pagodas, reflections of the candlelight and the moonlight mingle with each other. The moonlight and candle light, and the moon and pagoda shadows create a picturesque scene. See our Mid-Autumn Festival in Hangzhou page for more interesting activities and places to enjoy Mid-Autumn Festival. 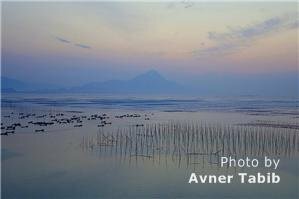 The Erhai Lake Moon is one of "the Four Best Sights" of Dali. 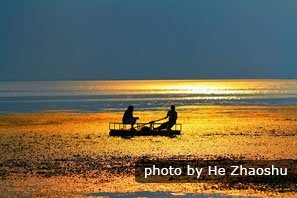 Every year on night 15 of lunar month 8, locals go boating on Erhai Lake. With the full moon hanging in the sky, reflections on the sparkling water make Erhai Lake very beautiful. 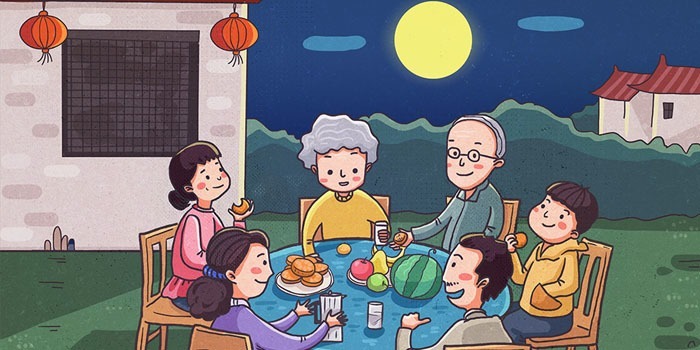 People appreciate the moon and eat mooncakes on the boats with their friends and family. Young men and young women usually sing in antiphonal style (responsively) to express their love to their loved ones. The Pearl River is picturesque, adorned by charming views. In the evening, both banks of the Pearl River are lit brightly. With the moon in the sky, the sparkling city lights and the moon reflecting on the river create a magical atmosphere. 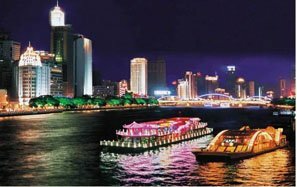 Mid-Autumn is a wonderful time to take a cruise on the Pearl River. You can appreciate the moon on the cruise while chatting with your family or friends, and enjoying music. 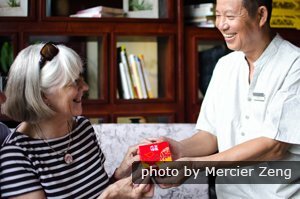 Mooncakes, tea, and wine are served on the cruise. 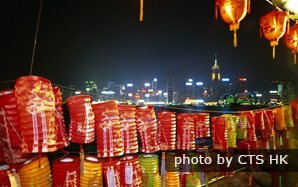 Click for more places to celebrate the Mid-Autumn Festival in Guangzhou. If you want to visit the places mentioned above or other places in China to experience the Mid-Autumn Festival, China Highlights can offer you our assistance. Contact us and we can help you arrange a tour according to your requirements.